The following blog post was written by Albert Chatigny, 2015 MBA Candidate. A week ago today, top admitted MBA and MS students from all over the world made their way to Rochester, NY for Scholarship Weekend. Some trickled in early to explore the city while others arrived Friday afternoon for the evening kickoff. For most of them, this was an opportunity to meet potential classmates for the first time. Simon offers this valuable opportunity to network with future classmates several months ahead of the first day of classes, all while pursuing an increase in scholarship awards! The weekend included a case study competition, various panel discussions, networking receptions with alumni, staff and current students, tours of campus and the surrounding communities, among other activities. Scholarship Weekend has engaged prospective students, current students and alumni each year for several years. It has become one of our favorite events; current students look forward to it for months. I was fortunate enough to participate in the event in 2013 as an admitted student and in 2014 and 2015 as a current student. 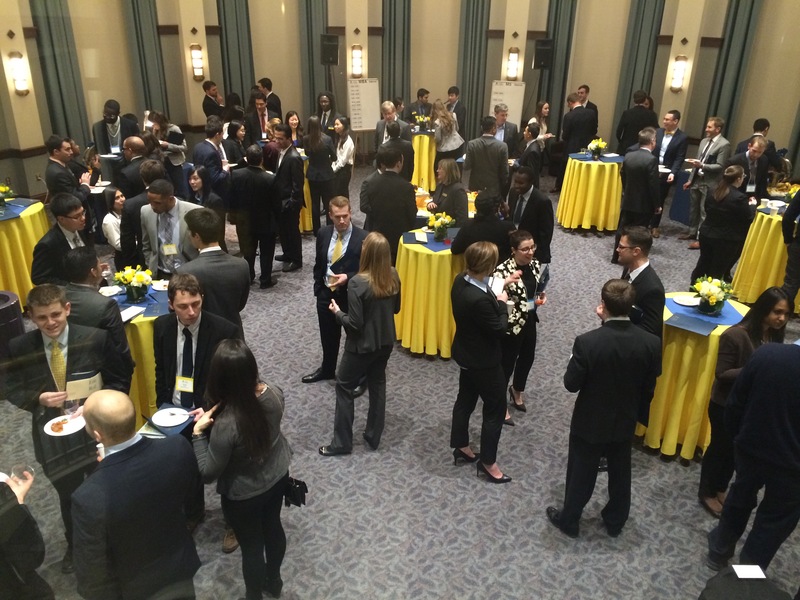 Scholarship Weekend attendees enjoy an on-campus networking reception with Simon students, faculty and alumni. Students were placed into teams on Friday evening and began working on the case immediately. Teams were given just over 12 hours to deliver their recommendations and presentations started shortly thereafter. Judges for the presentation portion of the event were recent Simon graduates, ranging from the Class of 2007 to 2014. Participants had the opportunity to network with and learn from these successful alumni throughout the weekend, and current students and staff were able to catch up with a few familiar faces. Once the competition was over, participants were able to relax and enjoy the rest of the scheduled activities, which included a lunch, informal group conversations with the aforementioned alumni and current students, dinner and happy hour. As much as Scholarship Weekend is an opportunity for Simon to learn more about its incoming class, it serves as a platform for those students to learn more about their respective program as well. This has always been my favorite portion of the event because it allows Simon to showcase its programs in a very honest light and to interact in a way that allows incoming students to get a clearer idea of what the next year or two of their lives will look like. Many students have claimed over the years that experiencing Scholarship Weekend is what solidified their decision to enroll. I have taken time to reflect on this past Scholarship Weekend – especially since it is the last one in which I will participate as a student. I still find it hard to believe how much was accomplished in such a short period of time. From the first scheduled activity Friday afternoon until the last one on Sunday, participants began developing what will undoubtedly be long-lasting relationships with future classmates. Scholarship Weekend has provided me with experiences that have been both impactful and unforgettable. I have seen three incredibly strong classes of Simon students participate in the event over the last two years, and I can hardly describe those experiences adequately in words. Excitement, challenge, frustration, sleep deprivation, triumph, and emphasis on community are just a few of the themes of one short weekend at Simon. Regardless of what my role has been in Scholarship Weekend, I have enjoyed each of them immensely. I have experienced Scholarship Weekend as an admitted student, current student and one day I look forward to experiencing it as an alumnus! Lastly, I want to send a huge thanks to everyone involved in Simon’s Scholarship Weekend. The work that goes into planning and executing the event is a huge task that our staff, students, alumni and faculty handle with tremendous success each year. Women’s Weekend- Don’t Miss this Opportunity! Attending Women’s Weekend was Quite an Experience for Me!